Ecommerce merchants always offer tons of deals and discounts to their store visitors and customers in the attempt to boost sales. As the competition level in this area is incredibly intense, it’s vital to create highly exclusive promotions. If you do not stand out from the crowd, nobody will be impressed by your deals – native Magento functionality will no longer amaze store visitors. Therefore, today we’d like to draw your attention to Amasty Special Promotions and Special Promotions Pro. These Magento 2 promotions extensions radically enhance the default functionality of the platform. Promo banners and product labels. Buy X items and get each additional one for $Y off. 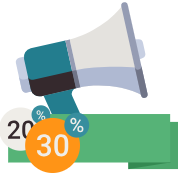 The Amasty’s Magento 2 promotions extension provides the ability to leverage all possible discount combinations. With the help of the module, you can combine everything you wish: the cheapest products, the most expensive goods, free items, and more. It is also possible to use promotions based on the number of products. For instance, you can offer customers to buy 5 items to get a 20% discount. To motivate them to purchase even more, you can create the same promotion, but provide a 25% discount for 8 items. Another promotion type allows you to provide customers with pleasant bonuses based on the spent amount. For instance, you can return 20 dollars for each $150 spent. As a result, you motivate customers to spend more money. Quantity step based promotions are also a part of the module. How can you leverage this new promotion rule? Check the following example. Let’s imagine a bookstore. In addition to the attempt to sell more, you want to motivate people to buy more books and read more. How can this goal be achieved? Provide buyers with a fixed discount on every second (third, fifth, sixth, etc.) item: get each X item with a $Y discount. Your customers will like this promotion for sure. Alternatively, you can rely on a percentage discount. Another action is called “All products after N”. It can be even more suitable for your goal. For instance, you can let customers buy 5 goods for the original price and then offer a fixed or a percentage discount for all the next items. Note that Special Promotions Pro by Amasty allows users to apply advanced conditions to set even more precise rules for promo campaigns. With this Magento 2 module, you can leverage custom conditions based on customer attributes or customers’ order history. Thus, you can create targeted promotions based on the details from your customers’ accounts, like gender, birth date, membership period, and more. For instance, you could offer a personalized discount to clients with a specific period of membership. As for the rules based on the orders history, you can set specific conditions based on the number of completed orders or total sum spent. This way, you can provide your clients with bonuses when they frequently purchase from your store or spend significant amounts of money. Besides, it is possible to target promotions based on the orders subselection, when you specify an order status and period after it was placed to trigger the rule. It is also necessary to mention that the Amasty Special Promotions Magento 2 extension supports all custom product options for creating even more flexible conditions. It means that you can leverage them in your promo campaigns. You just need to create a filter that will narrow down the selection of items available for the promotion. As a result, it is possible to set more precise limits applying special discounts only to particular products. Furthermore, integration with the Promo Banners extension by Amasty allows merchants to make their promotional campaigns more eye-catching and effective by placing promo banners to product pages. It is possible to display banners for all products, only specified ones, or selected categories. Admin users can also choose a banner position: whether at the top of a product page or after a product description. 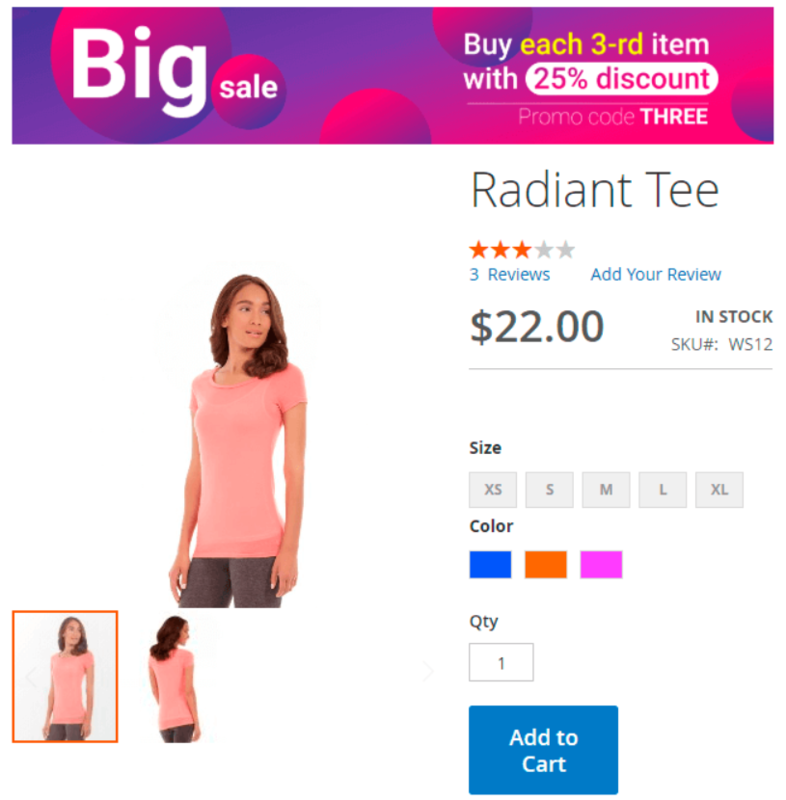 Besides, the Magento 2 promotions module provides an option to add colourful labels to specific goods for attracting your website visitors’ attention. The Magento 2 promotions extension is an excellent timesaver since all promotions can be created within a few minutes. The interface is brilliant, and you will easily master it without any help from third parties. Just check the backend section of this post: it illustrates core principles behind the admin interface of the Amasty Special Promotions Magento 2 module..
To manage existing rules and add a new cart price rule, navigate to Marketing -> Promotions -> Cart Price Rules. The relevant grid displays all essential details about each of your promo rules. 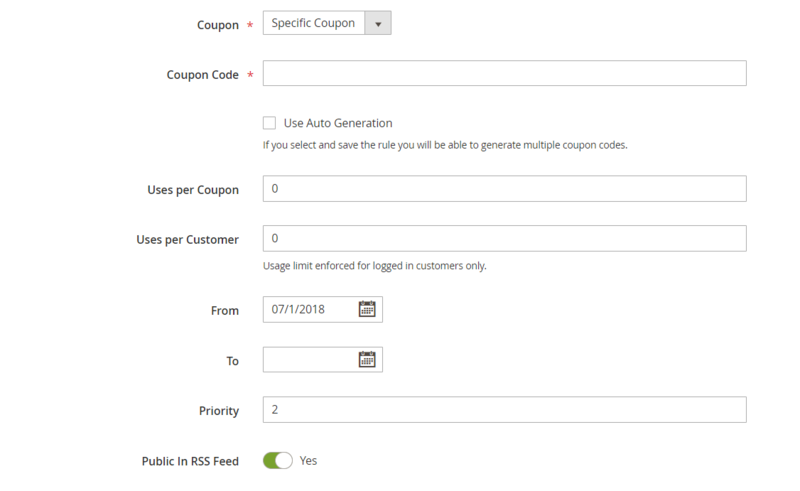 When creating a new rule, you will deal with six sections of settings: Rule Information, Conditions, Actions, Labels, Manage Coupon Codes, and Highlight Promotion. 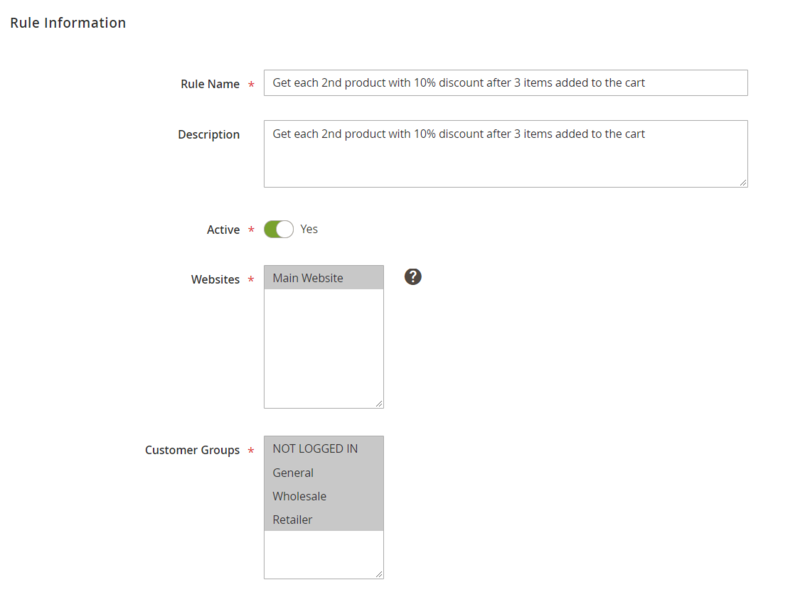 In the first section, you create a rule name and its description, activate/deactivate the rule, and select applicable store views and customer groups. Then, specify a coupon code if any, as well as the number of uses per coupon and customer, its validity period, and priority. Also, you can enable ‘Public in RSS Feed’ option here. The Conditions tab allows using different cart attributes and products subselection to create conditions that will trigger a promotion rule. As we’ve mentioned above, if you use Special Promotions Pro, you can also set conditions based on customer attributes and purchases history. 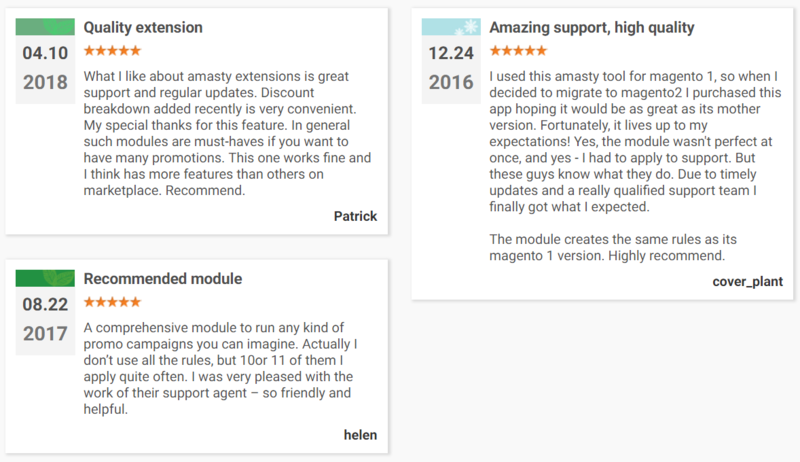 To create a unique promotion with the Magento 2 promotions extensions by Amasty, you need to choose one of the 20 available actions you’d like to apply. Some other options in the Actions tab vary depending on the action you choose. 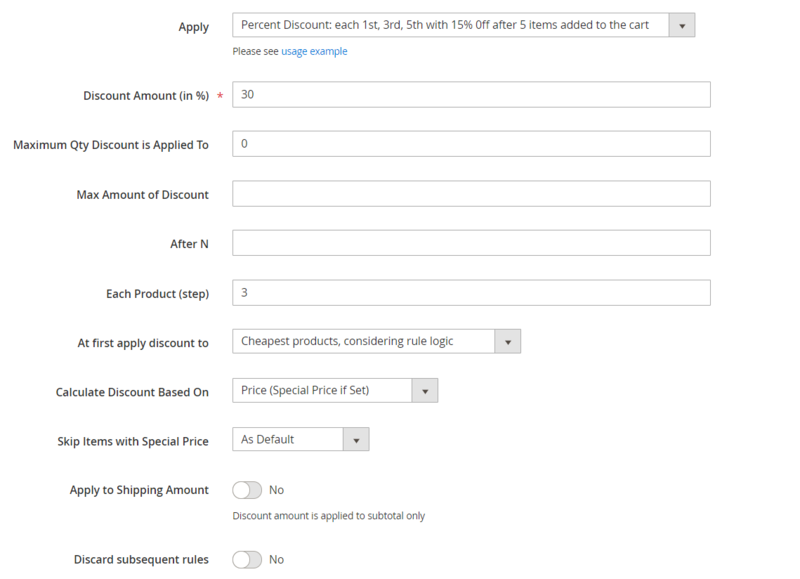 For example, for ‘Percent Discount: each 2-d, 4-th, 6-th with 15% Off’, you specify the following settings: Discount Amount (in %); Maximum Qty Discount is Applied To; Max Amount of Discount; After N; Each Product (step); At first apply discount to; Calculate Discount Based On; Skip Items with Special Price; Apply to Shipping Amount; Discard subsequent rules. There is a separate section in Actions where you can select cart item and product attributes for the conditions triggering the rule, as well as set Free Shipping options. In Labels, specify a default rule label and store view specific names. 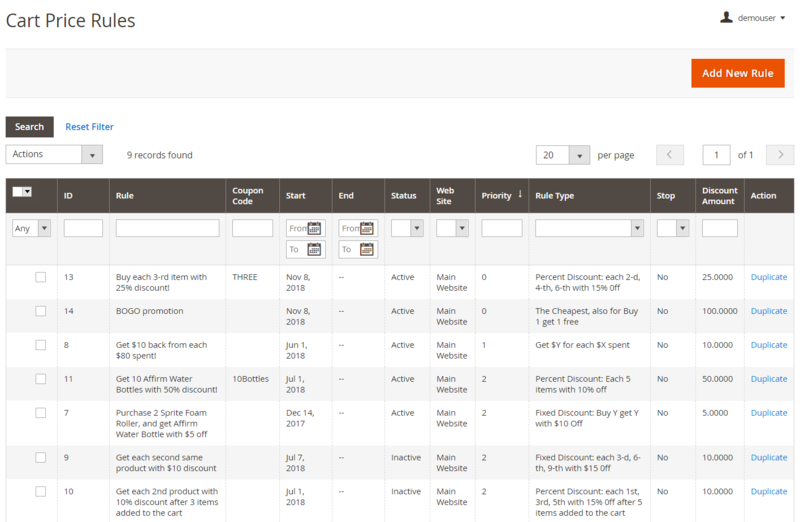 The next section – Manage Coupon Codes – lets you specify code parameters and generate the required number of coupons. In the last section of the new rule creation screen, you can highlight promotions by setting banners for all products, selected categories, or particular products based on their SKUs. Then, select which banner to show. 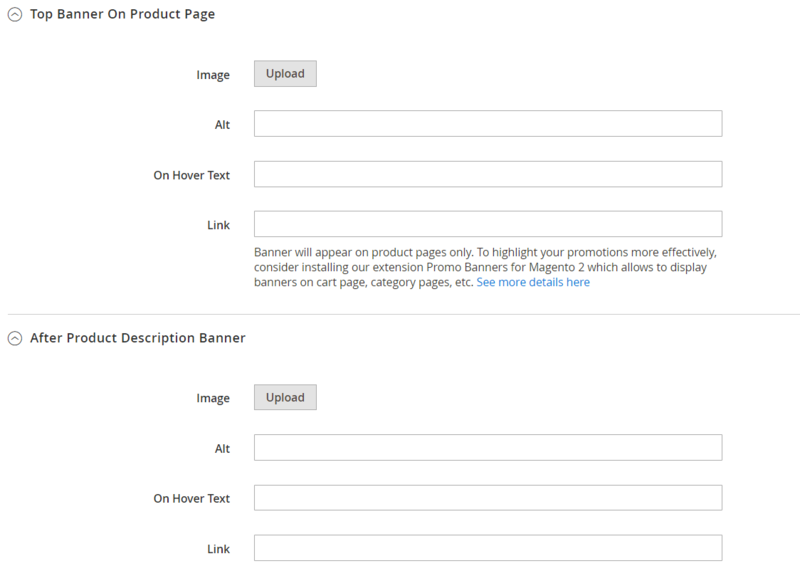 The first two options are: Top Banner on Product Page and After Product Description Banner. In their settings, you upload an image, specify alt text and the text displayed on a mouse hover, and insert a link forwarding to a relevant page after clicking on the banner. In case of selecting Product Labels as a banner, upload a necessary icon and specify alt text. On the general configuration page of Magento 2 Special Promotions, you can enable the extension to check special options values. Besides, general extension settings let you skip items with a special price and tire price and configurable items when a child product has a special price. 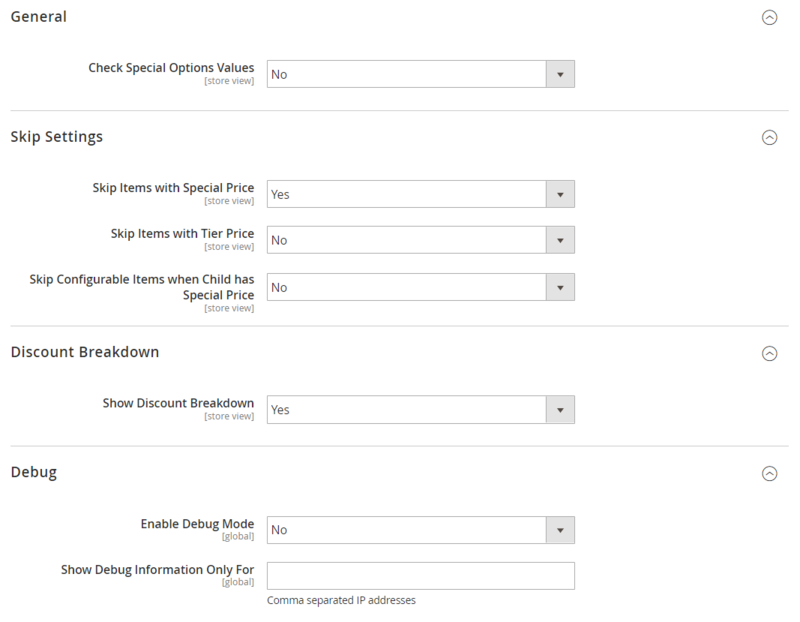 Also, you can enable the discount breakdown display in the shopping cart. For testing purposes, you can enable the debug mode and specify IP addresses for which you need to activate it. 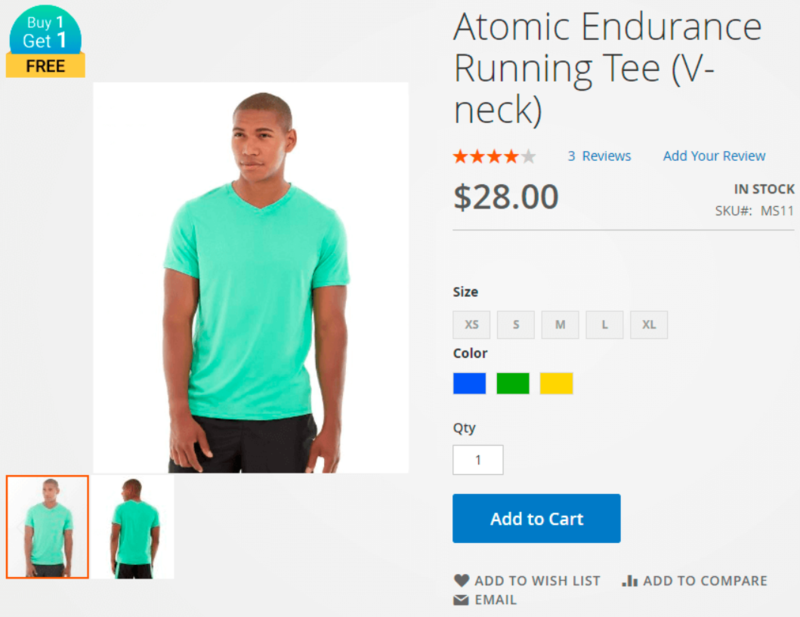 New feature: promo banners and product labels can be displayed on a product page now. The debug mode was implemented adding the ability to test how discounts are applied in the shopping cart. Now the module is integrated with Amasty Promo Banners and Amasty Product Labels. 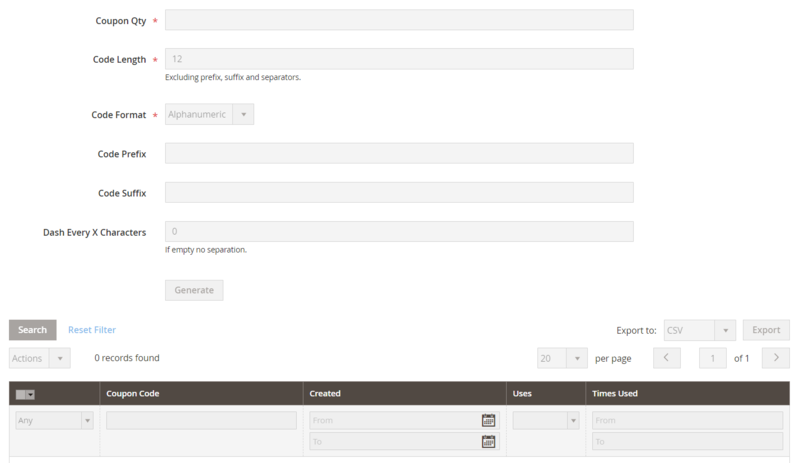 New function: the ability to manage rules via Magento API. Possibility to apply discounts to the same products for the “Each N-th” action was added. Order of discounts can be utilized now for the ‘Each N-th’, ‘Each Group of N’, and ‘Each Product After N’ actions. The discount breakdown was implemented: now it is possible to view all applied rules with the discount amount of each one. Links to the usage examples were added. “Each M-th After X-th” and “All Product after N” promo actions were combined into one “Each Product After N” action. “Buy X get N of Y” and “Buy X get Y” promo actions were combined into one “Buy X get Y” action. An attribute ‘Customer ID’ was added to the rule conditions. Amasty Special Promotions for Magento 2 and 1 is an intuitive and powerful tool for running promotions that will stand out from a plethora of deals offered by your competitors. As for the price, while Magento 1 extension costs just $99, the appropriate Magento 2 promotions module is more expensive – $249. Note the price of the M2 version of Special Promotions Pro is higher – $299, while you can buy its predecessor for $159.